Enerex SONA Multi is based on actual human study, and is an excellent source of Vitamins, Minerals, and Enzymes. It is also highly absorbable. The SONA is an advanced, scientifically balanced formula of Nature`s most nutritionally complete and powerful `greenfoods`: organically grown Alfalfa Leaf powder, organically grown Green Barley Juice powder, and Spirulina Blue-Green Algae. These green `superfoods` provide advanced antioxidant support in a live, whole food, rich in natural enzymes, vitamins, amino acids, essential fatty acids and other nutrients. Together they provide a nutritional balance that is greater than that of any one alone. Each `superfood` complements the other, providing a superior source of nutrition. Beta Carotene, Vitamin A (Palmitate), Vitamin D (Cholecalciferol), Vitamin E (d-Alpha Tocopheryl Acetate), Vitamin C (Ascorbic Acid), Thiamine (Vitamin B) Hydrochloride, Riboflavin (Vitamin B), Niacin (Vitamin B) Nicotinic Acid, Pantothenic Acid (Vitamin B) Ca-d-Pantothenate, Vitamin B (Pyridoxine HCI), Biotin (Vitamin B), Folate (Vitamin B) Folic Acid, Vitamin B (Cyanocobalamin), Calcium (HVP Chelate*), Magnesium (HVP Chelate*), Iron (HVP Chelate*), Zinc (HVP Chelate*), Manganese (HVP Chelate*), Copper (HVP Chelate*), Iodine (Potassium Iodide), Chromium (HVP Chelate*), Selenium (HVP Chelate*), Vanadium (HVP Chelate*), Molybdenum (HVP Chelate*), Protease (A. oryzae^), Lipase (R. oryzae^), Amylase (A. oryzae^), Cellulase (T. longibrachiatum^) Bamboo Extract (Silica), PABA (Para-Aminobenzoic Acid), Choline (Bitartrate), Inositol, Organic Alfalfa (Medicago sativa) Leaf, Organic Green Barley Juice Powder (Hardeum vulgare) Grass, Spirulina Blue-Green Algae (Spirulina platensis). Take 1 tablet 3 times daily, or as directed by a health care practitioner. Keep out of reach of children: there is enough iron in this product to seriously harm a child. 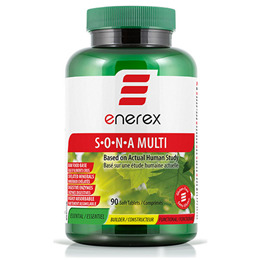 Below are reviews of Enerex SONA - Multivitamin - 90 Tablets by bodykind customers. If you have tried this product we'd love to hear what you think so please leave a review. It seems to be absorbed easily from the body.